What defines art? hmmm....it is a good question with no definitive answer. So I am going to say that I have been working on an art project. I am not saying much about it at this point. There is machine work as well as hand work in this. Yes, really! I am doing some hand work. Even more amazing it has been enjoyable. Now I think I could put on a movie and do this for a while. Time certainly flies when I am working on this piece. 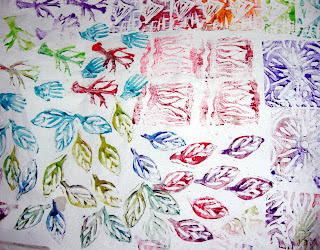 Later in the day Saturday, I did stamp another piece of fabric with just the leaf stamp. Again I can't decide which picture I like best so you get to see them both! I can't get them to line up side by side. If you know an easy way to do that in Blogger, let me in on the secret. In honor of Memorial Day I am continuing to support the Quilts of Valor. Iowa Public television has filmed a show on Quilts of Valor and there is a clip. My thanks to Marjorie for sharing it. Now I am sharing it with you . I confess I wiped my eyes once or twice. I happen to be in the age range of Mary Lou Metzger (I think I am several years younger.) I do still remember knowing people who were drafted and sent to Vietnam. So that part got to me. Hug a Veteran today and tell them "Thank you for my freedom." Last weekend I carved a couple of stamps and made a video to show you how. This weekend I finally got to stamp some fabric. I think I "wasted" an hour doing this. I have to say I love the results and will probably do more. However, next time I will do an entire piece with one stamp. 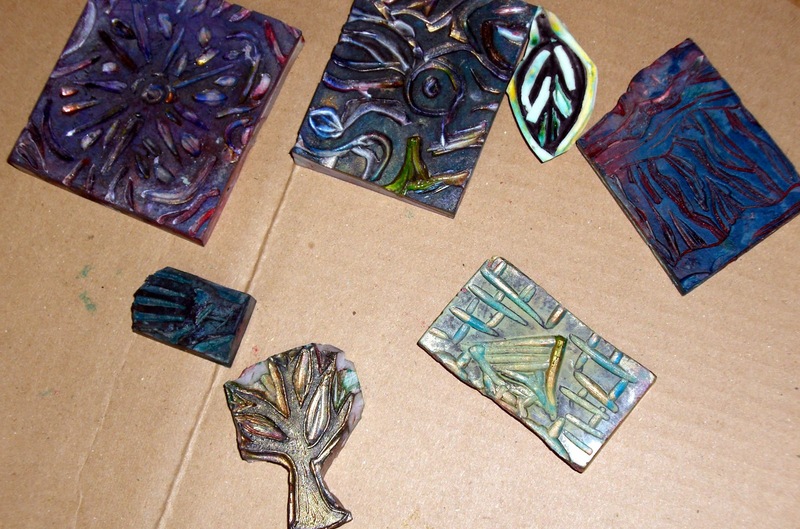 Stamps - your own hand carved (preferred) or purchased stamps. I carve my own. 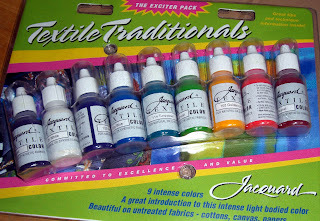 Paints that are made for textiles. 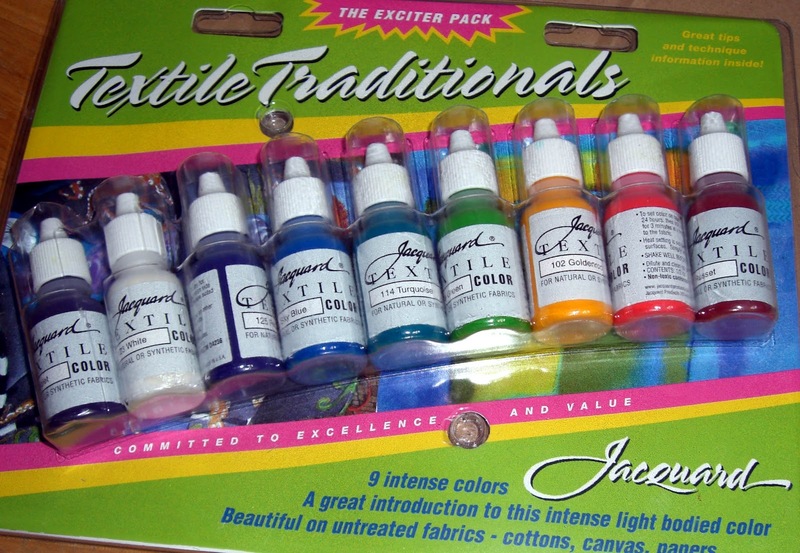 I got these Jacquard Textile paints in an "exciter" pack so I could try them and see if I like them. 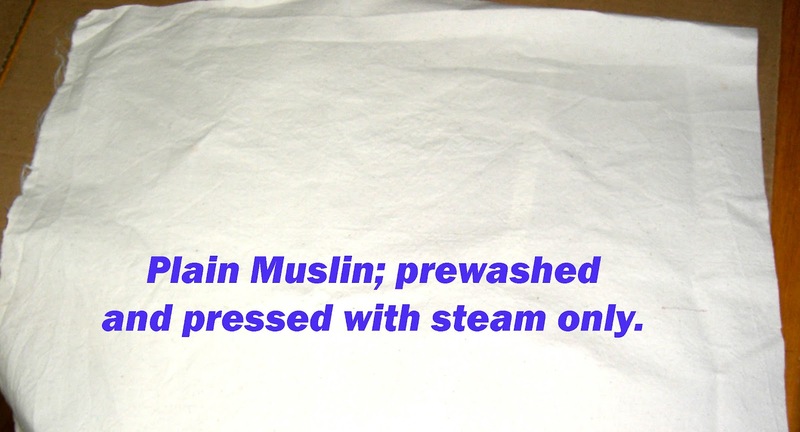 Cloth to stamp, this should be washed and pressed with steam only. Do not use fabric softener Do NOT starch it. The idea is to get the cloth clean and remove all sizing so the paint/dye will stay. 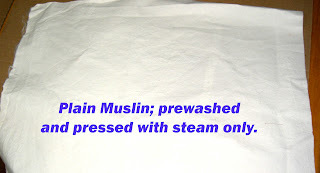 I bought some heavy muslin and washed and pressed it. 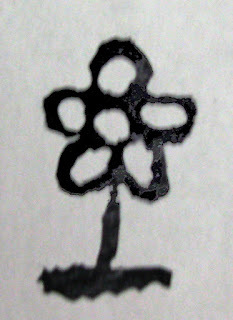 Something to apply the paint to the stamps. You can use small foam brushes. 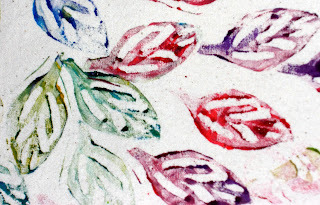 Soft watercolor/acrylic paint brushs, or you could squeeze the paint onto a glass surface (a piece of window glass or a smooth ceramic floor tile) roll it out with a brayer and use that like a stamp pad. I used the soft brush. Oh yes, and if you are using several colors, you will need a vat of some kind to rinse the brushes in. (then dry them with paper towel so they don't dilute the paint.) I had a paint bucket. You can use an old coffee can or a disposable plastic cup. You will also want to put down something to protect your surface. I used cardboard. You can put down newspaper (a few layers) or just work on a surface that you don't mind getting paint on. You may want to put something on the floor too. Accidents can happen and the paint will wreck your carpet and may stain your other flooring. Something to use as a paint palette to squeeze your paint onto. A foam disposable plate works well. A paper plate will absorb the paint. A sheet of wax paper or freezer paper will work also. Apply paint to the stamps, not too much, so have a "practice piece" to work on the first time. And you have made your own fabric designs. I can really see making a piece that is all leaves or maybe all trees. Here is a close-up of part of the leaf section. Notice that you can combine colors on one stamp. This is a "try it and play" option . So again, use your practice piece. Some practice pieces turn out as good at the planned piece. So save it a few days and see if you like it. The paint package says that these paints are permanent after heat setting. 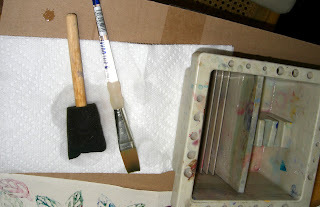 So I will let this dry and then iron it, with a press cloth over it to set the paints. I have no idea what I will just this fabric for just yet...but I will certainly use it in something. I hope your weekend is fun and creative. P.S. If you are on a septic system, do not wash your brushes and tools in the sink, use a container and pour the water and paint residue outside. The fine acrylic particles can clog your septic system. I suppose some of you have wondered what I am doing this week. 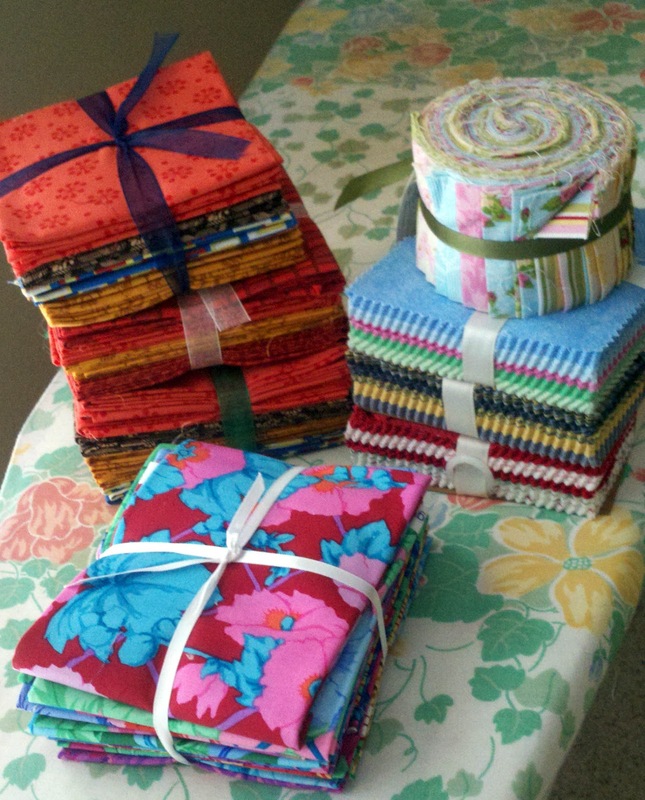 One evening was Mom's birthday, so I was out later than usual and didn't get any sewing done. 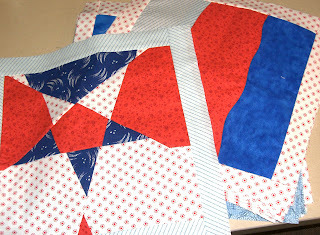 The other evenings, I worked on getting my Quilts of Valor blocks finished. 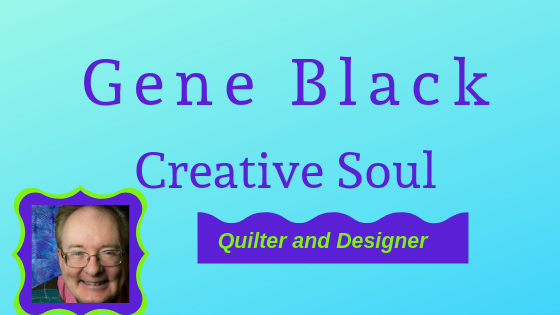 I decided that I would never make it to get the quilt completed in time. So I opted to send in blocks. 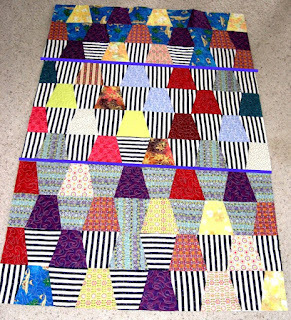 That meant that I had to up the size of the blocks to 12.5" by 12.5" No problem, just time consuming. 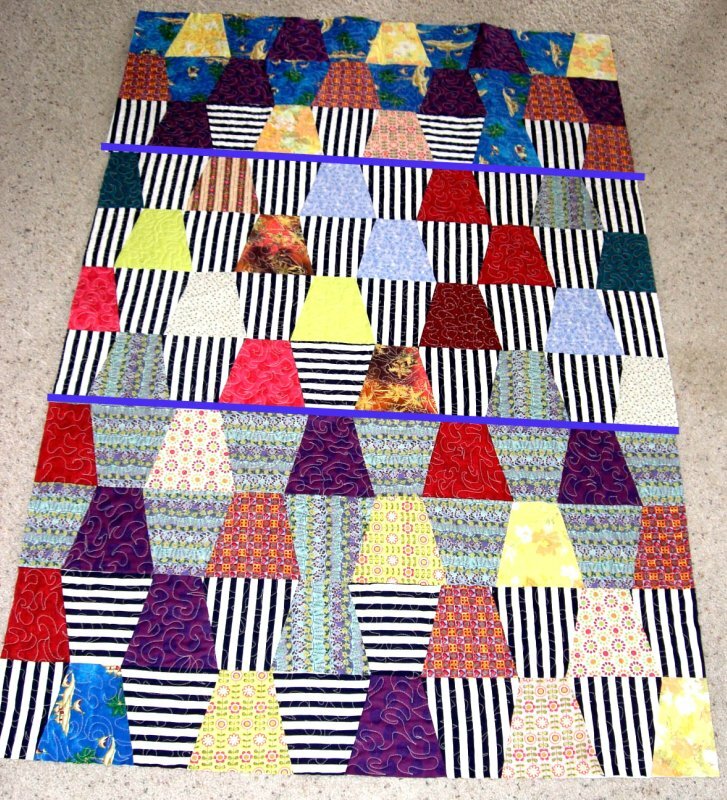 consisting of Stars, Wavy bars, and a few embroidered star blocks went into a Priority mail envelope and they are winging their way to the Linharts for the QOV challenge. I really hope they send me a picture of the completed quilt, but I am not holding my breath. They have lots to do without satisfying my whims. The important thing is that some soldier, active or retired, will get a warm quilt that was made with love. Hi, welcome to a glimpse at some of my past work. I thought that today I would show you a couple of paintings that I sold during my painting days. 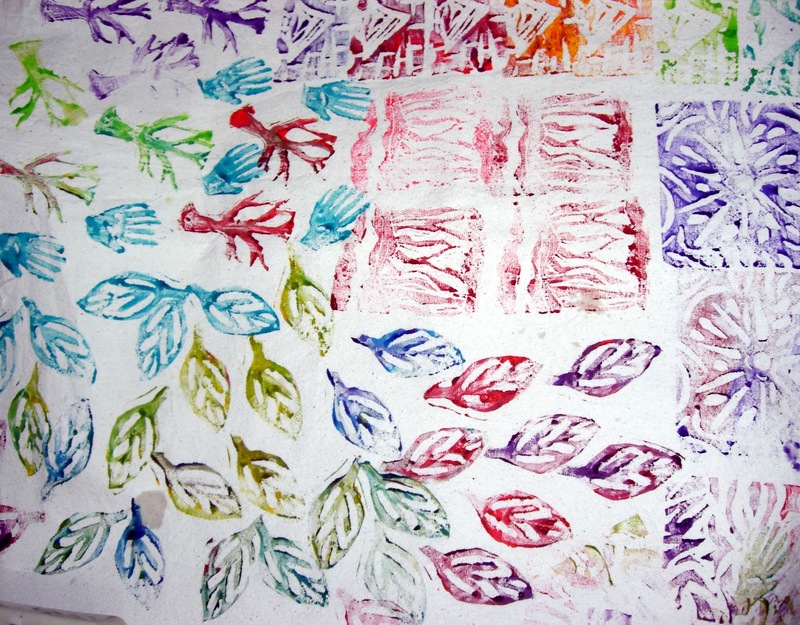 I have learned that it is possible to use my hand carved stamps for fabric painting also. Hopefully I will have time in a few days to show you some fabric I have embellished with my personal stamps. 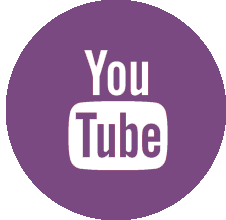 Is anyone interested in a video tutorial on carving stamps? Next up, for those of you who just don't like abstract (Pat!) 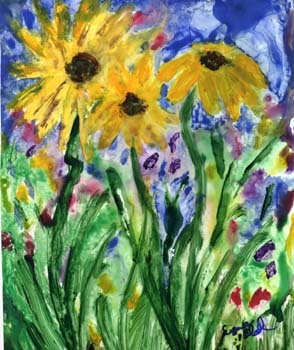 is a painting called "Daisy Dance." This painting is acrylic (my personal favorite painting medium) on a synthetic paper called Yupo. 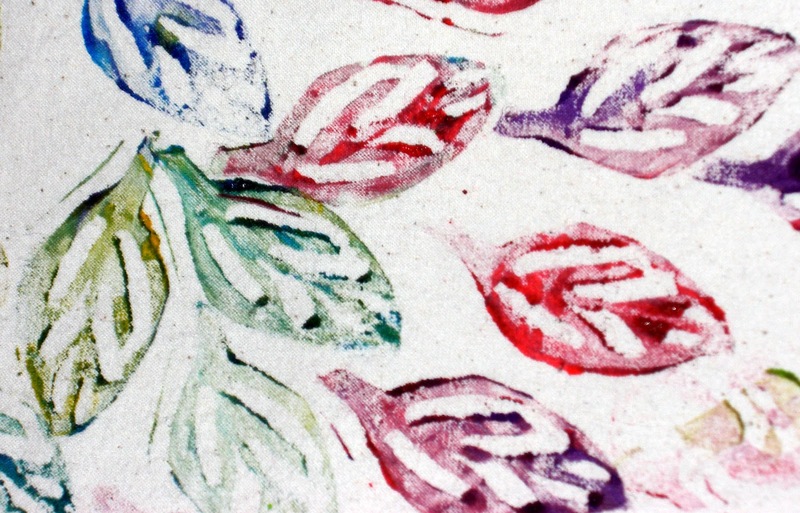 This paper has a smooth texture that allows the paint to "slide around." This results in a much look that is much more free and less contrived. This painting was donated to a fundraising auction and sold nicely. I have another version of it hanging in my bedroom. I guess you could say I painted a short series of two. 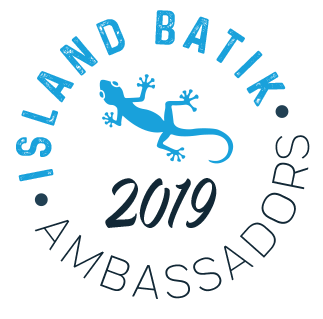 Saturday morning I went to a Floriani Event and met Beth Moon who is one of their educators. She talks Southern, being from Alabama, so we had a great time. I learned a few new things and brushed up my stabilizer knowledge. Then I spent the afternoon and evening sewing on my Tumbler quilt. 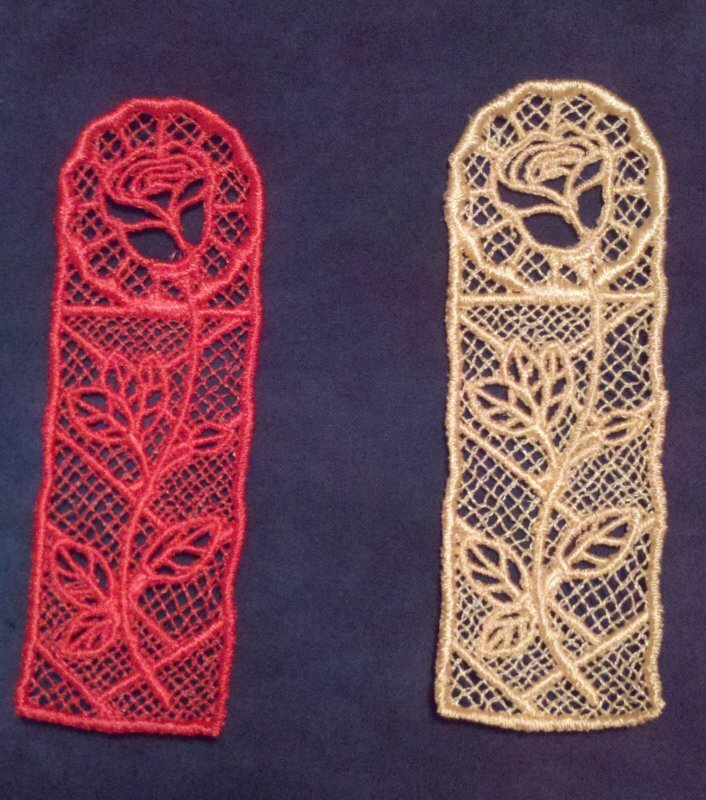 I did two more sections -which will complete the top. I also used up some scraps and extra strips and charms to "make cloth" -i.e. piece the back. Funny thing is I like the back piece as much or better than the front. My buddy said " Hey! That tan strip has a problem- it gets skinnier toward the end" I said "Yes I know, but the green one next to it does too. They just face opposite directions so it works out." 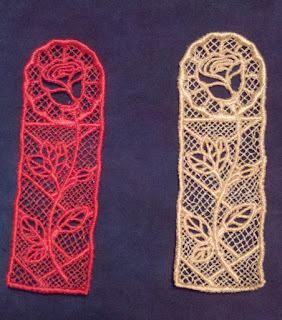 The nice part about this is that I had very little cutting to do - the tumblers were already cut and I still have spares! So it was nice mindless sewing for the most part. I am still helping the buddy that had surgery. A week or so after the surgery, he (probably) threw a small blood clot and went into atrial fibrillation. After a few days in the hospital and numerous scans, he was sent home on a blood thinner. He is currently doing well, but still needs help occasionally. (so I am zoinked - I need a vacation.) If the posts are sparse for a bit, or I don't comment on your blogs, forgive me . First is the explanation. I have been quiet for a few days. The fact is I have nothing made from this time to show. Life has gotten in they way of sewing. I did get an email telling me that I won a nifty ruler called "Angler 2" so I will tell you about it when I get it. I am going to share this painting that I named "Herewith"
This is a somewhat abstract night scene landscape with the moon peeking out from a smoky blue cloud. The moon is reflected several times on the "watery" surfaces in the landscape. To me, the mood of this painting is somewhat mysterious and romantic. One of the things I love most about this painting is the color scheme and intensity. 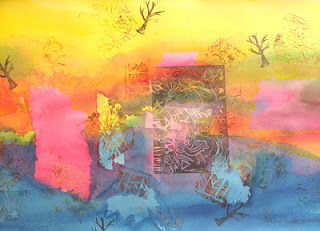 Is it any wonder that I like to use batiks, brights and hand dyed fabrics?